Once a month I manually update the pricing data on buyearthbound.com to help fans get the best possible deal and avoid paying too much. I was especially interested to check out prices now that EarthBound on the Wii U has been out for a while, so let’s take a look! Individual guides always sell so rarely nowadays that guide prices always fluctuate like crazy, so the increase doesn’t mean much. But the most surprising thing of all is that complete copies have dropped considerably! In fact, one complete set sold for less than some cart-only listings! Still curious to know more, I looked at the prices before and after EarthBound was released on the Wii U… before the release, the average was at $163.12, and the average price right now, after the release, is $163.19. So it’s like nothing really changed. Complete sets were similarly unchanged, so it seems like the Wii U release hasn’t had much of an effect at all. I don’t know what to make of this yet, but maybe it was naive of me to think cart prices would drop immediately after the re-release. Maybe it’ll take longer? Or maybe the fact there are more fans now means more people want the actual cart? If anyone has any ideas, let me know! Anyway, all that said, if you do want to get an original release version of EarthBound for the Super NES, check out the information on buyearthbound.com to avoid paying too much! 1: The price goes down due to higher availability. 2: The price goes up due to hipster cred of owning the original SNES version. I think you will need to see more people want a Wii U before the price drops any more. I can easily see someone right now willing to pay the $160 or less for a cart and wait for a WiiU price drop. The issue here is that the Wii U version of EarthBound is only cheaper than these eBay listings if you *already* have a Wii U. If you don’t already have a Wii U then the price to play EarthBound on Wii U is not $9.99 it’s either $309.98 or $359.98 for a new Wii U before tax and depending on which model you get. So, unless you really want a Wii U (which a lot of people, even Nintendo fans, don’t want) then it’s actually still cheaper to pay $163.19 for an original EarthBound cartridge. Most of the people hunting down EB cartridges probably already have SNES, but *even if they don’t* a working Super Nintendo with cords and controllers can be found for roughly $60. That brings the grand total to play the original EB to roughly $223.19 which is *still* cheaper than buying a new Wii U. Case in point: if your only goal is to play EarthBound legitimately, then an original cart, even at these prices, is still the cheapest way to go despite the game’s re-release on Wii U VC, which may be why we’re not seeing any significant price drop in eBay listings. Of course, original Chrono Trigger carts still go for outrageous prices and that game has been re-released to death on almost every platform imaginable, so in the end maybe some games are just like that. Yeah, exactly. It’s a collector’s market, pretty much. Your average gamer wouldn’t pay more than $10 for an original SNES cart, maybe $20 if they haven’t seen that game in a long time and it’s one they had as a kid. You lose most people when you charge $150+ for a game released for the SNES, the ones remaining either being rabid fans for collectors with big wallets. The SNES has a lot of weird anomalies like this with cart value. It’s not even that these games are rare or anything – it’s just that people are willing to pay that much for them, and sellers use that to their advantage. I know with Chrono Trigger, though, the value dropped for a while when the DS re-release came out (I think it was worth around $30 for an SNES cart then, and this wasn’t too long ago), but then it shot back up fairly recently. I’m guessing EarthBound didn’t get that drop because not as many people have a Wii U.
Yup, I called this months ago. As I speculated, if physical copies of other rare games like Radiant Silvergun (Sega Saturn, re-released on XBLA) and Chrono Trigger (also available on PSX FF collection, PSN, DS and IOS) haven’t gone down in value after their various re-releases, then it would probably be no different for Earthbound. People still desire collectible physical copies of games. Anyways, I’m happy to own EB both on cart and on my Wii U, re-playing it on the Gamepad is great. The game is more available, yes, but only an electronic copy. The physical copy is an icon, especially the SNES copy. As to what to expect for the future, the price of Earthbound for the SNES will only continue to slowly increase, I would guess. 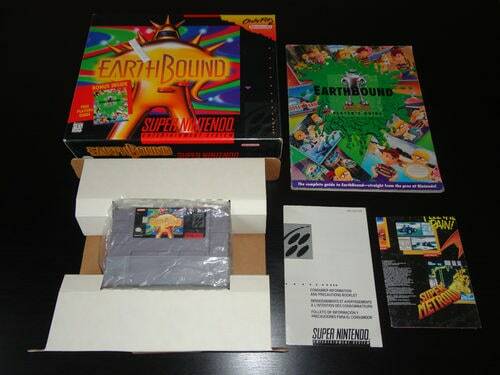 As more people gain exposure to Earthbound, more people will become likely to want to have a copy of the original game. Demand goes up for the physical copies, and so the price does as well. It will be interesting to see how it goes! I think these prices are being sustained by non-buyers, professional collectors trying to keep these prices at absurd levels. Target had a sale this month in Canada where you could get a Wii U basic for $150. Kick in $10 to download EarthBound. That’s a whole console with the game for the same price as the average download. I know that price isn’t available everywhere, but it does underline how nuts this is. Indeed it is nuts. 162 dollars for an earthbound cartridge is flippin ludicrous. Should have bought the game when I had the chance back in 1998 for 40 dollars. I’ll wait for next months summary. I predict it’ll either shoot up or shoot down, but then, what do I know. I’m shocked both positively and negatively. I’m happy my copy I bought for $150 isn’t going down but I’m also sad that these guys who take all the games and make the prices high to take advantage over fans are still getting to take advantage. I don’t get why people keep thinking the price will go down. It’s really simple economics: Supply and Demand. The Supply is going to be the same. No more carts for Earthbound are being made. The number of people selling, though, could change. The more people who sell, the more likely the prices could start dropping to keep things competitive. But I don’t see people suddenly selling all their EarthBound cartridges any time soon. People want to keep EarthBound, as it has a very loyal fanbase and people who really, really want to keep their cartridges. This really trends towards fewer cartridges being available in the long-run. As for demand, the demand is only going to go up! Lots of people were just exposed to EarthBound for the first time the last little while, and even more people finally broke down and played the game for the first time. And NOT just because it’s on the Wii U now. There are plenty of people who likely saw all the news coverage (which was very substantial, with just about every major gaming site and publication out there highlighting EarthBound’s re-release) and decided to give emulation a try and see what all the fuss is about. So the numbers of people who played EarthBound for the first time are likely going to be higher than the number of people who own a Wii U. Some of those people are going to love the game. And those people will look into how much buying the actual SNES cartridge is. And some of them will be able to afford it. And so, the demand will continue to go up a tiny little bit. Limited supply together with increasing demand does not, in any way, allow for lower prices. No one buys a physical cart to play the game. ROMs and emulators served the purpose before, and now the Wii U release covers that need much more elegantly. 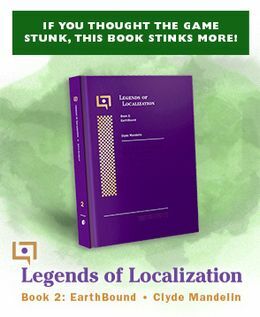 I’ll echo TragicManner; the price is only going to increase in the long run, as long as Earthbound is culturally relevant. Haha, I meant something completely different than I wrote. 😛 Silly me. What I meant to say is: The number of people who are going to play EarthBound for the first time will not be limited to simply the people who are playing it for the first time on the Wii U. The news coverage has made people curious, and even people without a Wii U ended up picking up an emulator and giving it a try. That’s what I meant. Ultimately, with the attention EarthBound has gotten, you can rest assured that it wasn’t only Wii U owners who discovered EarthBound for the first time. The unfortunate side-effect of this for people who want to buy the original cartridge is that demand might go up due to more people becoming aware of it. It’s not that people want to buy it just so they can play it, the cartridge is still uncommon, so people want it more as a collector’s item than anything really. But the thing is, Earthbound isn’t exactly a very uncommon game. As it is ALWAYS on ebay, there is never NOT a cart available online. In fact there are over 20 copies on ebay just today. People keep buying the carts. If less people buy the carts, the sellers will have to lower their prices. Economics. I bought a mint Eartbound CIB with everything for 450$ 3 months ago as an investment, according to this my investment has dropped to the price I paid! That’s only the average price, and only for the last month. Some sold for significantly more than $450, with the highest price at $700. That said, it’s probably not wise to buy video games as investments (or at least long-term ones), it sounds a lot like when people bought comic books as investments in the 90s, or when people bought Beanie Babies as investments, or other similar situations. Unless of course you invested in Metroid Prime Trilogy or Xenoblade Chronicles back when they first came out (^_~) Check the news: those two games are selling for $85 and $90 respectively *used* at GameStop. Sorry this is isn’t about the NES version but I thought i’d just share this other deal I found.